​In 1758, during the French and Indian War, the building now referred to as the Old Barracks was constructed by the colony of New Jersey in direct response to petitions from residents who were protesting compulsory quartering of soldiers in their own homes. It was one of five such buildings throughout New Jersey constructed for the purpose of housing British soldiers during the winter months of the war, and it is the only one still standing. At the time it was built, it was the largest building in Trenton and the second largest public building in New Jersey after Nassau Hall in Princeton. The Barracks was used for this initial purpose until the end of the war in 1766 and is the only extant and restored military structure left in New Jersey that is associated with the Colonial Wars. Throughout the Revolutionary War, the Barracks was used for a variety of purposes by both the British and the Americans. British prisoners of war were held in the Officers' House, four companies of the Second New Jersey Regiment of the Continental Line were raised here, and in 1777 the Barracks became an army hospital under Dr. Bodo Otto, who oversaw smallpox inoculations for the Continental Army. Disease killed more soldiers than combat during the Revolutionary War, and was the biggest threat to the Continental Army. This was the first mass medical treatment in the Western Hemisphere, and the Barracks is one of the only surviving structures used for that purpose. The Barracks, and Trenton, are most known for the events of December 1776. At the beginning of the month, British and Hessian troops occupied Trenton, and briefly stayed in the Barracks prior to the Battles of Trenton. Colonists, loyal to the English king, also arrived, seeking protection from the soldiers, and were believed to be staying at the Barracks when Washington and his troops marched into Trenton on the morning of December 26th. After the miraculously successful Battles of Trenton and Princeton, the Americans returned to Trenton in January 1777 and made use of the now empty Barracks, primarily as the aforementioned hospital. At the beginning of the 20th century, members of the Daughters of the American Revolution and the Colonial Dames organized the Old Barracks Association and spearheaded a campaign to "Save the Old Barracks". 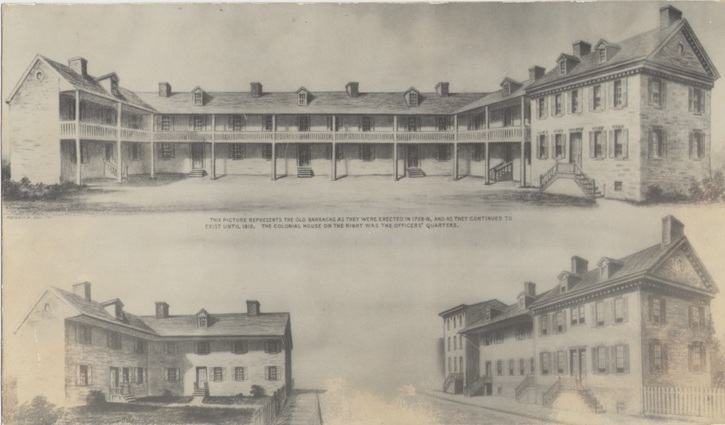 In 1902 they purchased the southern portion of the original Barracks with the intention of using it as a repository for all things connected to the American Revolution and the colonial period. In 1914 the State of New Jersey bought the north section and the Old Barracks Association agreed to transfer ownership of their portion, with the agreement they would continue to operate the building as a museum, and the building was restored with a rebuilt middle section. From 1985 to 1998 the building underwent a multi-million dollar second restoration, resulting in its current appearance, which is believed to be a much more accurate representation of how it would have looked in 1758.